Namaste Raja Yogis and Yoginis! Tomorrow is Canada's Birth-Day, so I assume you all have loads of activities and celebrations already in the works. Let's get together next week for a special event at the University of Alberta's Japanese Garden. 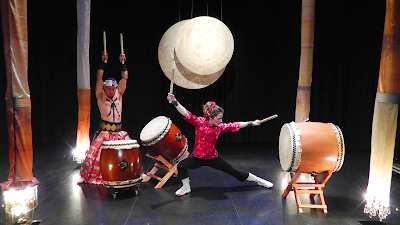 Take a mini taiko drumming workshop led by Booming Tree Taiko. Sign up for the workshop in advance, or just come to watch. Feel free to come early and wander the gardens, have a treat at the Patio Cafe, enjoy the butterfly house or some quiet outdoor meditation. Coincidentally, Booming Tree is also performing at Strathcona County's Canada Day Festivities near the new REMAX Spray Park. Looks like they will be there at noon and from 6:30 - 10 pm. Hope to see you at one of these events (or maybe both!). Om Bolo Canada Ki - Jai!!! Happy 60th Birthday Swami Swaroopananda!